Okay, back to Reading For Research Month after a break for Time Management Tuesday and a good whine. And, yes, I'm a day behind again. 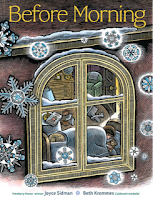 Yesterday author/illustrator Jen Betton explains that she often writes out picture book texts so she'll better understand what the books' authors are doing. She also storyboards the books to see how the illustrators handle pacing and composition. I believe I've heard of this type of thing before, at least as far as text is concerned. 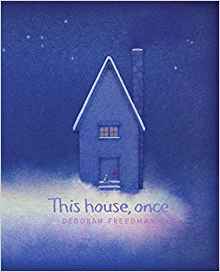 Writing out a picture book's text, especially if you assign the text to a page, as it appears in the book, helps new writers get a feel for things like page breaks or the kind of flow/excitement being used to encourage readers to move on to the next page. Yikes. I was able to find and read a lot of today's books. This House, Once by Deborah Friedman is a lovely book with an unusual subject, the origins of the various parts of a house. Someone writing out this text would become very aware of how the author/illustrator integrated the words with her pictures. 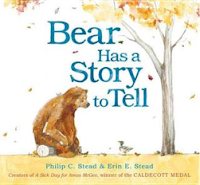 Someone writing out the text of Philip C. Stead's Bear Has a Story to Tell (illustrations by Erin. E. Stead) would pick up on the repetition of give and take between Bear and the other characters. Then I love the parallel beginning and ending, the looping that occurs. 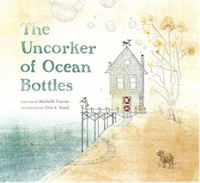 The Uncorker of Ocean Bottles by Michelle Cuevas and illustrated, again, by Erin E. Stead would seem like a very traditional story, by which I mean not necessarily a picture book story, to someone copying it. Then past the mid-point we get some of the same give-and-take repetition we saw in Bear Has a Story to Tell. Interesting point--the only child in this young children's book is a minor character who doesn't have any lines. The main character and most of the supporting players are all adults. I saved Joyce Sidman's Before Morning for last because it really blew me away. The elegant poem, which Sidman describes in an afterward as an invocation, is both totally different from the story told by Beth Krommes' illustrations and makes total sense with them. Invocations are, to my knowledge, prayers. Look at that cover illustration. Make anyone else think of a church's stained glass window? I don't think I'm giving anything away by saying the prayer is answered. I don't know how copying this would work for anybody, but the book is amazing to read, at any rate. Can this copying business help me with my picture book manuscript? If I could find the right book, very possibly.